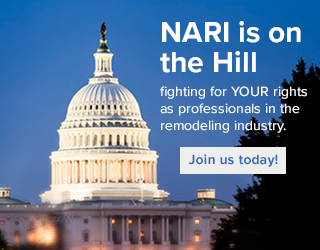 NARI is on the Hill, fighting for YOUR rights as professionals in the remodeling industry. NARI’s efforts focus on nine federal advocacy priorities: Energy efficiency, tax reform, industry regulation, work force development, small business programs, and financing and access to credit. The NARI Government Affairs Committee meets monthly on the third Monday of the month via conference call. The committee discusses legislative and regulatory issues that impact your business on a daily basics. You are welcome to join the discussion. Use the contact information below and request to be a member of the Government Affairs Committee. Join us today! (847) 298-9200 or info@nari.org.